Inflammations and infections in eyes are of various types. Presence of inflammatory cells in the eye is usually termed as Hypopyon. According to medical terms, the Hypopyon is a leukocytic exudate present in the anterior portion of eyes. Identifying this condition is very easy for the experts because it creates redness in the episclera and conjunctiva. Hypopyon can be defined as condition in which a person experiences bulging eyes because of the pus accumulation in anterior portion. 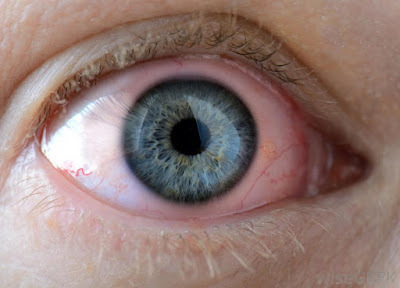 According to some experts, this is an inflammatory infection which develops in case of corneal ulcer. This condition also develops when white blood cells continue to surround base of frontal chamber of eyes. Basically, this problem results because of immune reaction. Immune system of body accumulates the white blood cells in frontal chamber to create a defense line against the pathogens such as bacteria, fungi and viruses. Hypopyon may develop if this defense line remains for longer. Hypoponic ulcers vary depending on the type of infectious agent and the age of the patient. In adults ulcer caused by pneumococci is characteristic kind of ulcer called as ulcus serpens due to its tendency to slip on the cornea in a serpiginous way. Typical ulcus serpens are a greyish or yellowish white lesion near central area of the cornea. Opacity is larger at the edges than at the center and is particularly prominent in one direction. A cloudy gray area, consisting of fine lines, surrounds the disc, but is also more prominent in the same direction. When a person should see eye specialists? Actually, Hypopyon is not considered a dangerous infection in most of the references. It is reported that this condition develops when white blood cells are discharged for the protection of eyes in case of attack of different pathogens. Following symptoms are important to remember. Continuous irritation: Patients usually experience continuous irritation in the anterior portion of eyes. It happens because of pus. Accumulation of pus: Pus is a clear indication of hypopyon. It develops because of the white blood cell accumulation in the eyes. Redness with swelling: Clear swelling and redness in the eyes is a symptom of this inflammatory infection. There are several causes of this inflammatory infection. According to eye specialists, anterior portion of the eye is very sensitive and it is a complex of various systems. Following things may be a cause of this infection. Viral infection: Any type of viral infection persisting inside the eye may cause hypopyon. It has been noticed that majority of the patients reported with this infection have a previous record of viral infections. Ulcers: Well defined ulcers inside the cornea always leads to development of infections in the eyes. In most of the cases, this condition develops the inflammation if persists. Iris and Uvea Infections: Infections with both systems causes the inflammation. It is important to see a specialist if you feel irritation in the eye. Fungal and bacterial infections: Our eyes are sensitive. Fungal and bacterial infections always disturb the functioning of systems present inside the eyes. This develops redness and fluids in the eye causing swelling. Tuberculosis: Patients of tuberculosis have 40 % chances of hypopyon development. According to the eye specialists and latest publications, the Hypopyon should not be depleted from the eye. It is a big source of eye protection. It helps to keep pathogens such as viruses, fungi and bacteria away from sensitive organs. However, medical procedures should be considered if this condition persists for longer. Patients have experienced anterior synechiae and close angle glaucoma because of the excessive buildup of white blood cells.